The longest-lived continuously important contributor to comics passed away this week at the age of 85. He was drawing and illustrating from his hospital bed until the end, reported his son, Adam, a titan in the field of comics himself. Joe Kubert began drawing comics in the 1930s and 1940s, working on All Star Comics at DC, where he first became identified with Hawkman, a character he would be closely tied with throughout his career. Mr. Kubert began by drawing Hawkman’s adventures in the JSA, but then moved on to illustrate not only for DC, but also for Marvel and several other companies. His most associated characters include the golden age as well as silver age Hawkman. Along with Gardner Fox, Kubert redefined Hawkman from being a reincarnated Egyptian prince to being the Thanagarian policeman that most of us between the ages of 25-60 grew up with. Kubert also is closely tied with Sgt. Rock, whose book he illustrated in his gritty, emotional style. Kubert hit his height during the silver age of comics, but where most of his era faded into the background as the silver age wound down, Kubert stayed vital and current comics on the shelf at this death bear his signature style, including recent issues in the Before Watchmen series. Kubert started his own school of cartooning and art, where he trained such luminaries as his sons Adam and Andy, as well as J. Michael Spurlock, Amanda Conner, and Tom Mandrake, among others. Many will remember him for his science fiction style of the 60s with his Hawkman run in the silver age, or his drawings of Sgt. 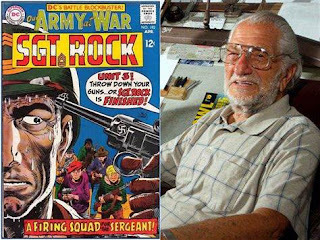 Rock and Enemy Ace in his war comics, but Joe Kubert also was a man who spoke out and wrote about liberty and freedom and peace. Some of his later work included serious looks at the Warsaw Ghetto Uprising, The Bosnia Civil War, as well as Vietnam. Joe Kubert is one of the rare talents who never stopped doing what he loved. While others made huge, inflated, oversized images of themselves long after they quit doing much toward comics (see a certain writer who makes frequent cameos in films), Joe Kubert distinguished himself as working through four different ages of comics—the golden age, the silver age, the bronze age, and the modern age. He never lost a step in his craft, and continued drawing until his death from multiple myeloma. I will remember Mr. Kubert for his sweeping images of Hawkman flying against the sky, using the weapons of Earth’s past to fight the weird enemies of the present and future. I will remember Kubert’s emotional and raw rendering of the violence of war in Sgt. Rock and other titles. I will also remember a man devoted to his craft and fans. 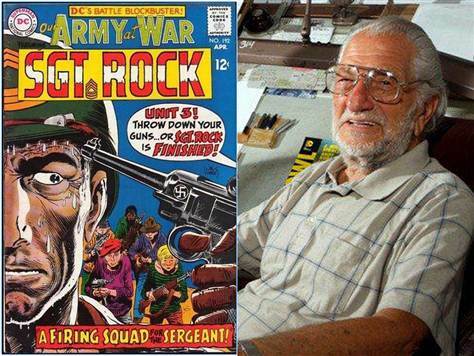 As long as the school, his work, and his sons carry on, Joe Kubert lives forever. Godspeed, sir, and God be with your family at this time.